spend some great times with your family and friends. Don't strain yourself too much in holiday gifts and cooking. simple things mean more than anything. that I've been making for several Christmas. Wish everyone a great holiday season! Place the oven racks in the upper and lower thirds of the oven and preheat the oven to 375F. Beat the butter in a electric mixer at medium high speed for around 5 mins or until the butter is pale, light and fluffy. Add sugar to the butter and beat for another 3 to 5 mins or until light and fluffy. Add corn syrup, beat for a few seconds. Add milk and vanilla and beat until blended. Reduce speed to low and add the flour mixture. Beat until just smooth, scrapping down the side if necessary. 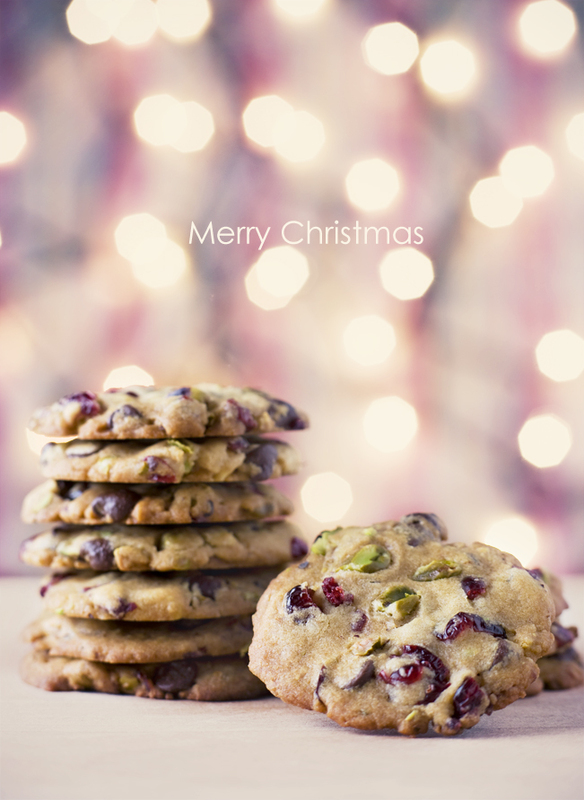 Stir in chocolate chips, pistachios and dried cranberries with a rubber spatula. Press the dough together with your hands. Shape the dough into 1" balls and place them, 1-1/2" apart, on a baking sheet lied with silpat. (or butter the baking sheet). Flatten the dough with the palm of your hand to a 1/2" thick disk. Bake for 4 mins, switch position of the baking sheet and then bake for another 4 to 6 mins, or until the cookies are golden brown. Cool the cookies on the baking sheets for 3 mins and then transfer to a wire rack to cool completely. I hope I can bake mine as nice as yours! Thanks for sharing! @Jun - I'm sure you can do it. It's very easy to make. Give it a try! Asta - Hope you had a great holidays! Let me know if you and your son like these cookies. Mmm, how did I miss these! So festive and pretty. What great texture with the nuts, dried cranberries, and chocolate!